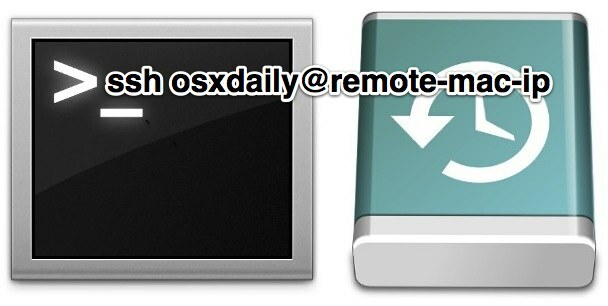 Time Machine backups can be triggered remotely thanks to SSH (Remote Login) and the command line. This is an excellent solution to use if you left the home or office without making an important backup, though the SSH requirement does add a potential layer of complexity that may make it more appropriate for advanced users. Those who prefer the GUI might be better served starting a Time Machine backup remotely by using Remote Access from an iPhone or iPad. If you are concerned about a particular file or folder being backed up, using a past tip to compare backups can also be used to verify that a recent backup is even necessary. You probably guessed it already, but this same trick can be used to start and stop Time Machine backups locally from the command line as well. Nohup sets the SIGHUP signal (given by the logout process) to be ignored. The nomenclature after the ‘>’ sign means that all output is silently ignored. The last ampersand puts this process in the background. The problem with SSH is you must leave the port open on the firewall/router. A better way might be to set up a mail filter for a verified email address and passphrase, which triggers an Automator action. Backup should start running in 90 seconds and you can logoff immediately.